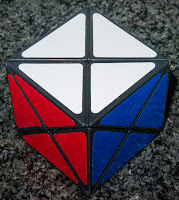 This post is a bit late because I attended the 11th Midlands puzzle party on my usual day of posting and seeing as each post can take many hours it was never going to be possible on that day. I then could not post on the Sunday because I had to work. Dreadful, I know!! But the on-call rota needed to be written and unfortunately it's down to me!! Took 8 hours and after that and the required booze to recover, it was also never going to happen. My final apology is that this post may be more than my usual amount of garbage! I was up almost all night last night on-call and my vocabulary and grammar skills are a little jaded. In fact if there's a long pause during this article it's because I have fallen asleep on my keyboardddddddddd ZZZzzzzzz! So Cat Stevens wrote in 1965 and sang in 1967 The worst (or was it first?) cut is the deepest - followed also in 1967 by PP Arnold and then Keith Arnold in 1973 and Rod Stewart in 1977. Finally the great Sheryl Crow did it in 2003. Now what the hell is he on about? He's lost the plot! Can that really all be blamed on lack of sleep? Probably not! The combination of a great puzzle party, a night up on-call and a rather large supply of great puzzles have gone straight to my head! Well, all of these great singers complaining about a deep cut as well as spending last night anaesthetising for an emergency Laparotomy (yes it's safe to follow that link!) 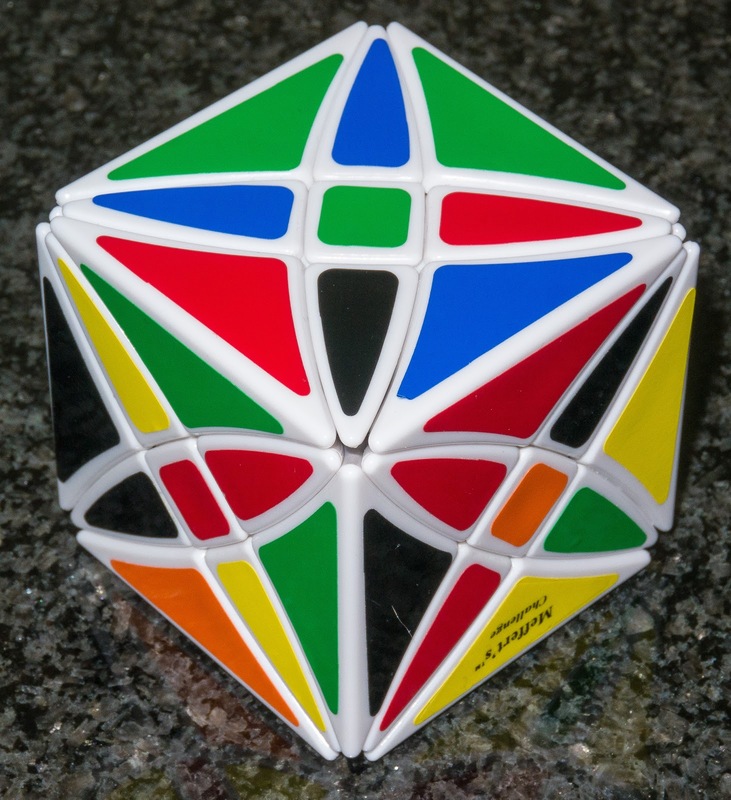 brought to the front of my tiny mind that I have many puzzles which share a common theme of geometry, axis of turning and size yet their solve process seems to vary considerably and can become extremely tough with the "deepest" cuts. Now before you all run away screaming "Aaaargh! Not another twisty puzzle! ", bear with me - I'm not going to get too much into how they are solved. In the beginning God created the heaven and the no! scratch that! 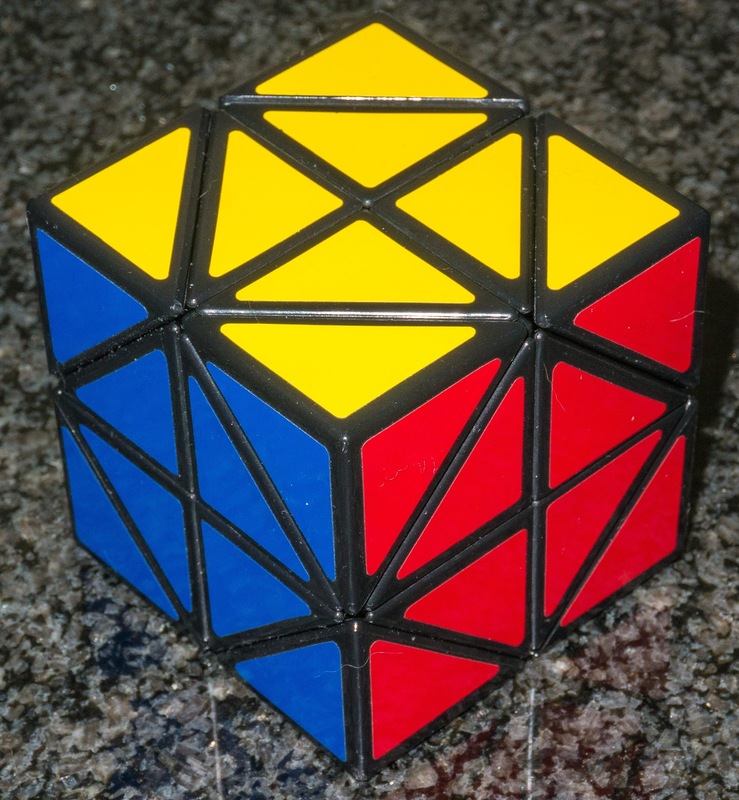 He created the Rubik cube and all was good in the world at least for those who could solve it. 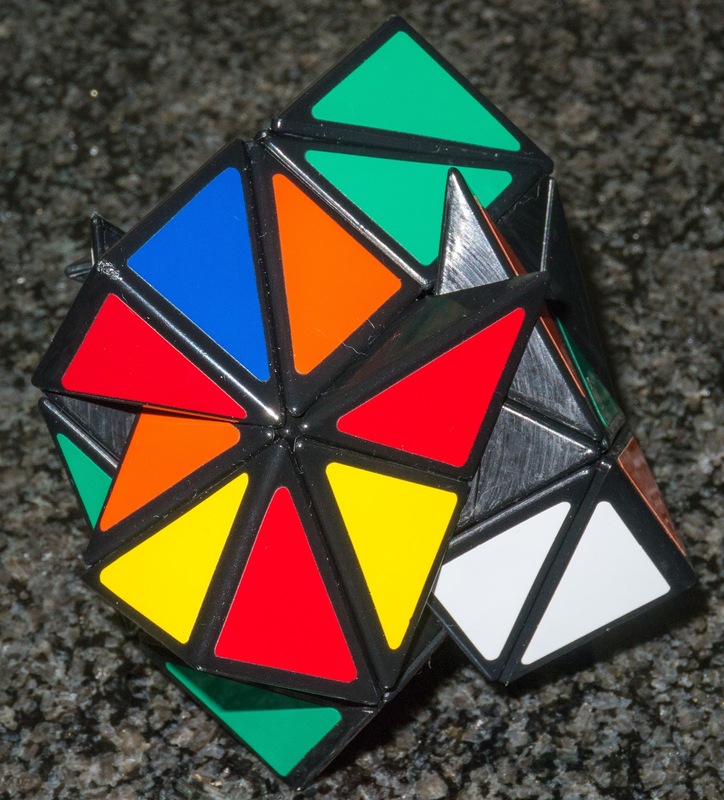 Later on the Devil came along and invented other puzzles to entice us to the twisty side and man began to party (puzzle party)! Yes definitely not enough sleep. Having created a few variants of the cube, giving us more layers etc, some bright spark suggested having different parts that rotate. 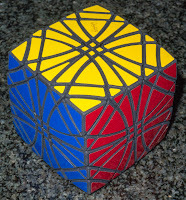 One of the most interesting groups is the corner turning cubes pictured above. 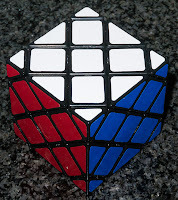 They weren't developed as a progression from simplest on but for a beginner to twisties or someone wanting to move on from the basic face turning cubes then this might be a nice avenue to explore. I would suggest starting with the Dino cube. 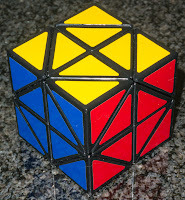 It is a pure corner turning cube where the cut meets the diagonal across the centre of the cube - It moves like a dream and looks as awful to an outsider as any twisty puzzle but requires absolutely no algorithms or complex thought - just solve it entirely by intuition - it's a feel good cube! I bought mine in the UK from Puzl because I needed it fast for this article but it can easily be bought from HKNowstore or Puzzle Master. 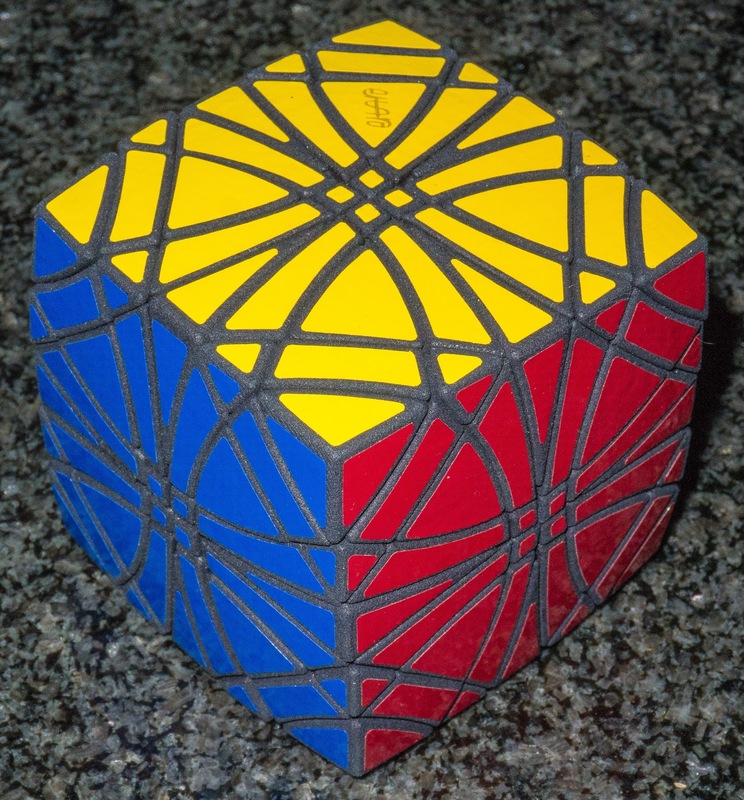 Now staying with cubes, does the whole depth issue continue with other cut geometries? Sort of! 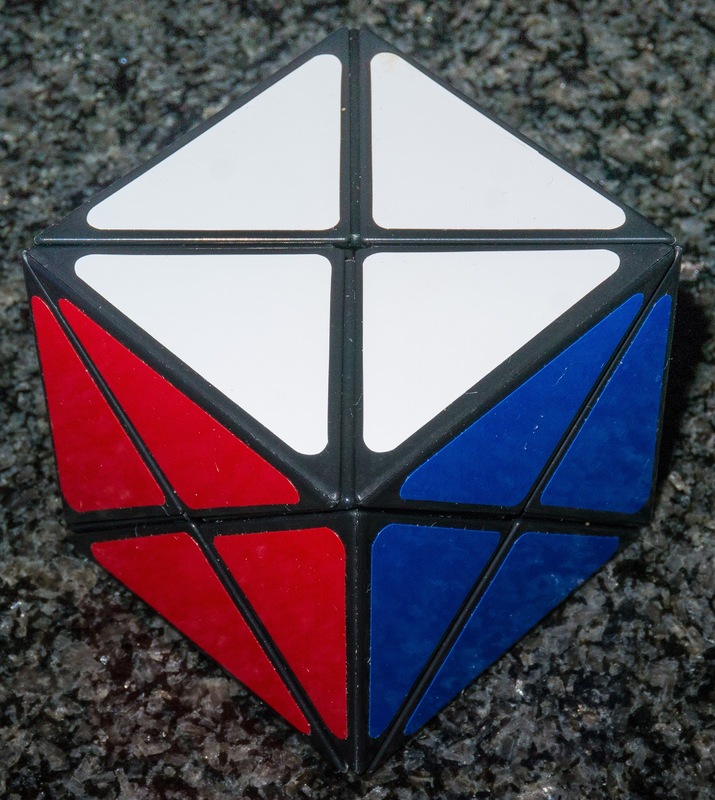 HK - doesn't seem to be available in the UK or Puzzle Master just now. For the truly masochistic, truly brilliant or truly stupid (I leave you to tell me which is me!!) 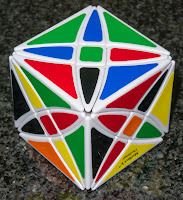 then there is a Master version available (double the number of cuts!). 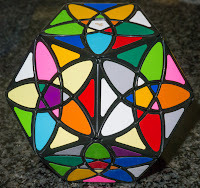 It is not mass produced, it is a Shapeways printed plastic puzzle designed by the amazing Eitan Cher and consequently a rather expensive undertaking but absolutely stunning. The addition of the deep and superficial cuts really ups the ante and one of the greatest twisty puzzles on the TP forum (Burgo) has referred to it as one of the hardest puzzles he owns!!! 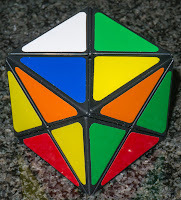 Needless to say, I have not yet had the courage to scramble mine yet - although one or 2 of the boys at the last Midlands puzzle party nearly gave me a heart attack by starting to scramble it!! Surely that must be the end of the journey? Are you exhausted? Me too for many reasons! But one of this last group came very close to killing me! 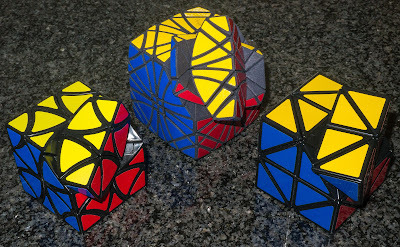 We have done the cubes but another very popular twisty geometry is the Dodecahedron and the designers have been at it again. 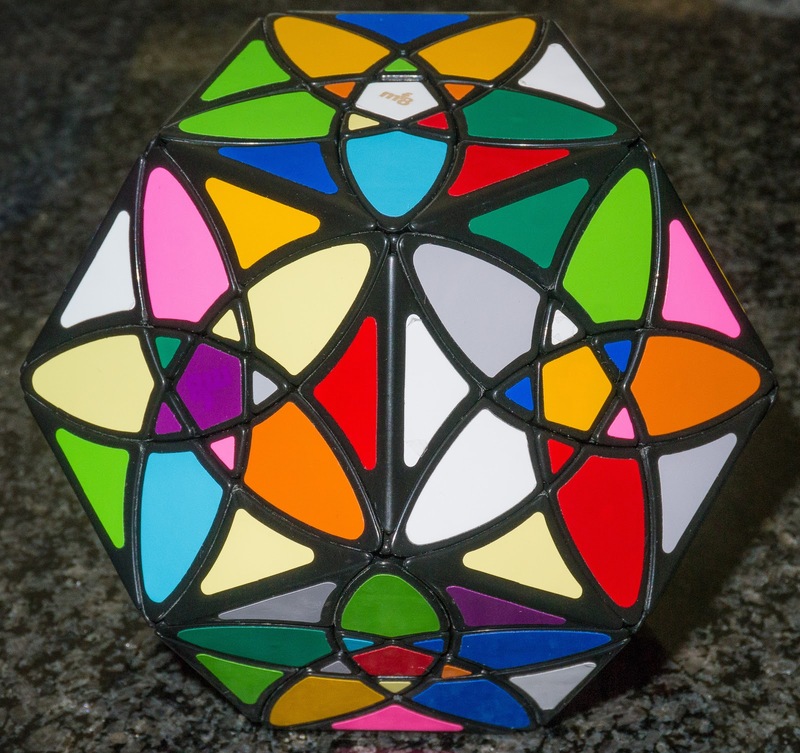 Originally I was happy having solved the Megaminx which is effectively just a 3x3 face turning dodecahedron, and then bought the 2x2 version (Kilominx/Flowerminx) and finally succumbed and bought the 4x4 version (Master Kilominx) all of which are a pleasant way to spend an afternoon. 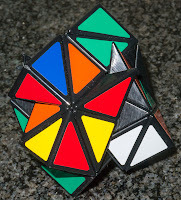 A deeper cut version of the megaminx is the Starminx I which I have not yet attempted - it is supposed to be very hard indeed. But last year MF8 (producers of some of the most amazing complex puzzles) released what has been unofficially called the Rex Dodecahedron because of the way it looks like a Rex cube. The same vertex to vertex cuts have been made deeper by the use of curved cuts and this has produced the petals, centres and those (bloody!) triangles. 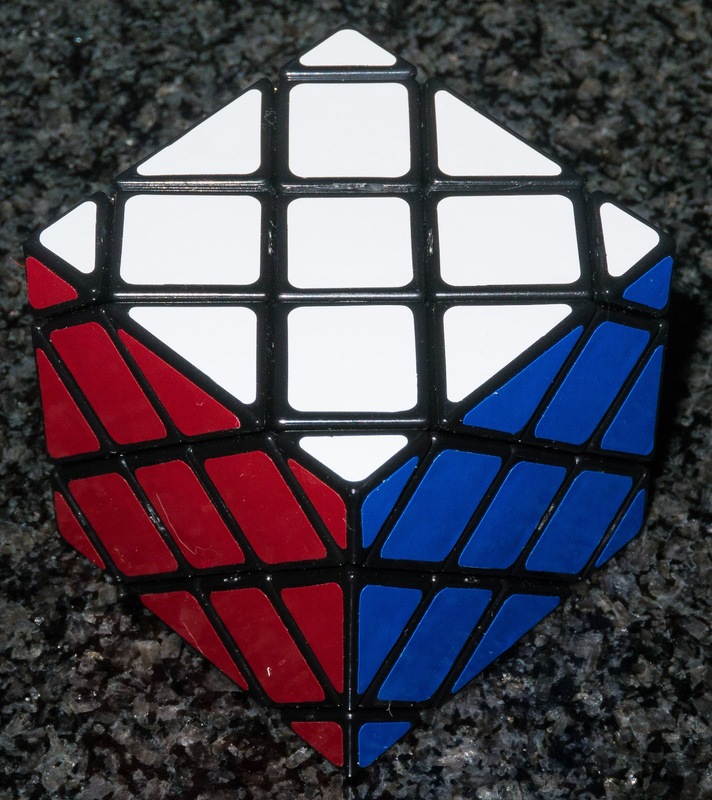 It needs a lot of patience to make it turn well and even more patience to solve it! 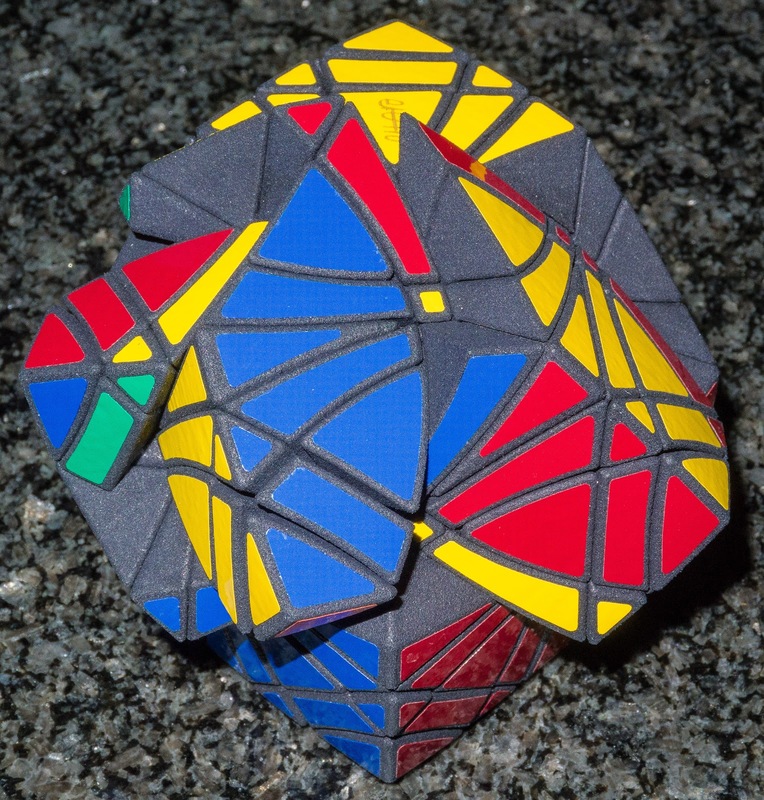 This one is horrendous - it took me a month to solve it and I very nearly gave up on it. You start off feeling fantastic as it is possible to solve the bottom half completely by intuition! Yay!!! Then working on the top half again, using intuition alone you can work through the edges and petals. Lulled into a false sense of security you then begin to work on the centres - not too bad and only one easy algorithm. 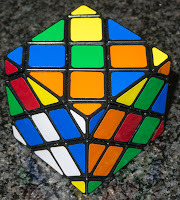 Then it's time to start placing those damned triangles (all 30 of them) - I have a 14 move algorithm to cycle 3 of them. But what if they aren't in the right places? Well simple, you use setup moves to put them in the right places and then do the algorithm! This is where my sanity began to unravel! Sometimes you can need 5-8 setup moves before the algorithm and then do the exact reverse. Now I barely remember who I am so how am I going to remember all these moves? Almost no chance at all! I attempted this many many many times and often forgot my setup moves and scrambled the big bugger by accident - start again! My other issue was explosions!! If you're not careful then a small misalignment can lead to a lot of small pieces on the floor and a very prolonged reassembly. Eventually I got more and more proficient and with a huge shout I did it - finally my chest pain has subsided! The worst cut is the deepest." Just ask any surgical patient! !